Glasgow, Kentucky, (June 25, 2015) There seems to be a lot of jubilation in the Sneed Family camp as the recent news of a new member has been announced. The name has not been released yet, but as soon as they know another press release will be forth coming. No this is not another singer or musician and this one cannot be fired from the position about to be held. Of course the new addition is a brand new baby. Caleb and Amanda Cowan will be presenting the Sneed Family with their first GRANDCHILD!!!!! There is a big smile on Caleb’s face and there is a special glow about Amanda. Neither of those compare to the almost boastful pleasure seen on the face of Grandfather-to-be Jeff Sneed, while future Grandmother Pam Sneed is just keeping her cool until the big day arrives. In other Sneed Family news, the big Loretta Lynn concert is being brought to you by the Sneed Family on Friday, July 10th @7:00PM cst. at the Plaza Theatre in Glasgow, Ky. For tickets call 270-361-2101 or purchase online at plaza .org. Better hurry because there are only 46 tickets left. The Sneed Family is living the dream night after night, singing the songs that change lives. From early beginnings in a small Kentucky town, this group has flourished into their own niche, rising to national success in such a short period of time. In early 2008 The Sneed Family launched a brand new Christian Television Show called “Sneed Family Music” seen in over 5 million homes each week. The Show also brings the faces of Gospel music into the homes of believers and non-believers alike. The Sneed Family believes that this show is their part of the Great Commission. Other than their television show being such a success, The Sneed Family has acquired many accolades of their own. Early 2013 The Sneed Family received the honor of being chosen to host the first Loretta Lynn Gospel Music Festival on her ranch in Hurricane Mills, TN. In 2014 the Absolutely Gospel Music Awards awarded the Sneed Family “Breakthrough Artist of the Year”, and 2014 Band of The Year from Christian Voice Magazine. Also in 2013, The Sneed Family was nominated as the Favorite New Mixed Group in the prestigious Singing News Fan Awards. The Sneed Family has a heart for ministry, distinct style, and their live band allows them to give a versatile performance. Their desire is that God would use the message in their music to help lead many people to a “heart felt” salvation and ultimately a home in Heaven. Nashville, Tenn (June 3, 2015) Absolutely Gospel Music is announcing a new turn for this year’s AGM Festival. Normally held each year in the middle of July for a week long series, this year it will be a couple of one night concerts in different areas of the state. Due to some unforeseen complications and of no fault of the facility, River of Life in Smyrna, TN will not be able to host the Festival this year. Understandably, there were no other facilities available for a week long concert series on such short notice, so AGM decided to turn a stumbling block into a stepping stone. This year, the first concert will be held in conjunction with the Marcelly’s Dream Mission Project in which a portion of the proceeds will go to benefit this spectacular mission program. This first concert will be Thursday, August 20th at the South Cleveland Church of God, in Cleveland, TN, where Rev. Chris Moody is Pastor. Featured artists will be The Isaacs and The Browders, two favorites from past AGM events. The second concert will be announced soon. For this year the concert will be called the AGM World Missions Benefit Concert. To purchase tickets email seats@absolutelygospel.com or call 423-488-5924 . 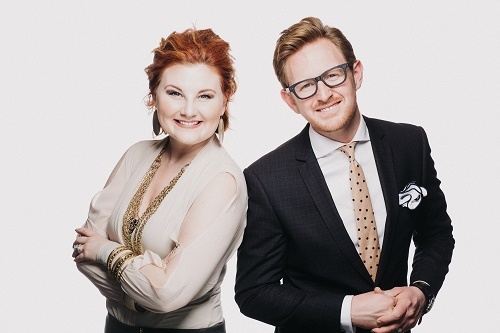 Weleetka, OK (June 3, 2015) Multi-award nominated Southern Gospel artist, The Williamsons, are announcing their first Homecoming Concert, complete with a dinner available. This exciting event will take place Saturday, June 20th at the Union Valley Church, just south of Ada, Oklahoma. 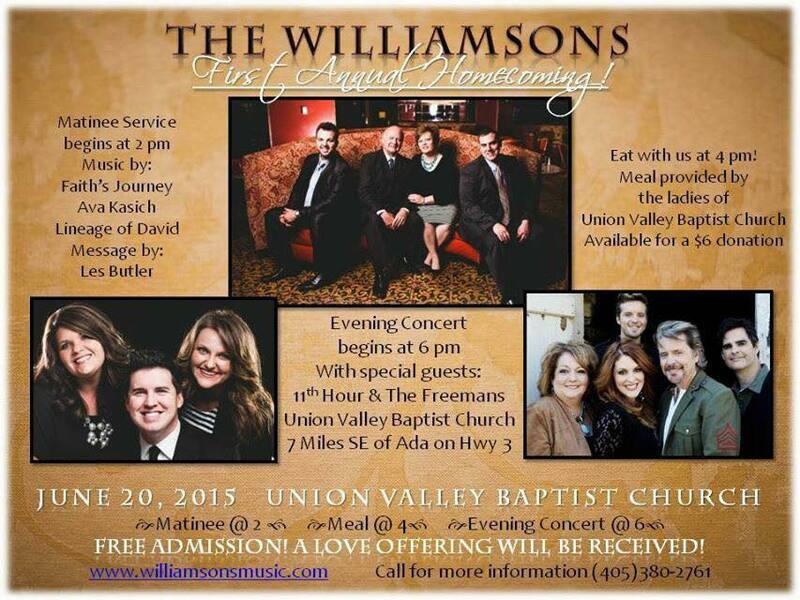 The Williamsons are thrilled to have the Freemans and 11th Hour performing. Formed as a family group back in 1969 as the Williamson Family, but in 1998 Donnie Williamson and his sister Tennie, changed the name of the group to the Homesteaders, and then in 2010 Donnie returned the group back to the family name of The Williamsons. The big Homecoming Concert will be an all-day event starting with a 2:00 PM Matinee featuring The Williamsons, with Faiths Journey, Ava Kasich, Lineage of David and preaching by Les Butler. At 4:00PM there will be an old fashioned Supper offered together with the artists made by the church ladies for a cost of $6. Rounding out the evening will be a dynamic 6:00PM Evening Concert featuring The Williamsons, 11th Hour, and The Freemans. THE EVENT IS FREE – A LOVE OFFERING WILL BE RECEIVED. For more information about the concert: http://tinyurl.com/williamsonshomecoming . Nashville, Tenn (June 2, 2015) Award winning Gospel trio Three Bridges made a trek to Houston, Texas for a special holiday concert. It rained the whole week before and the area was already pretty saturated from those rains. Scheduled to perform outside on Monday, May 25th, Memorial Day, everyone including the promoter was praying for good weather to get the celebration finished in time before the next batch of storms moved in. By God’s grace, the outside tent was set up, Three Bridges managed to get their sound system in place, and a 40 piece orchestra was assembled and in place by the opening note at 11:00 AM when the festivities started. Still in God’s favor they finished and got packed and ready to leave Houston the rain started and as you have seen on the news the City was flooded. Trinity, NC (May 26, 2015) On the heels of the Absolutely Gospel Music Award’s Breakthrough Artist of the Year nomination, Red Hen Records recording artist Zach and Rodney along with Michael Lee are excited to announce the release of another hit filled album for young Country Gospel fans. 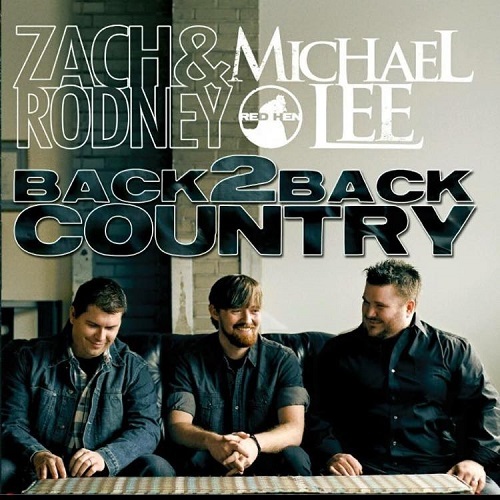 The new album “Back 2 Back Country” was made available on iTunes and all other downloadable sites on May 7th, with the hard copy available This album contains 10 brand new songs, four from Zach and Rodney, four from Michael Lee, and two songs together. Produced by Rick and Micah Schweinsberg of Red Hen Records, this project includes songs penned by such songwriters as Ronnie Hinson, Gerald Crabb, and Mark Narmore, as well as eight of the ten songs co-written by, Zach Mashburn, Rodney Hedrick, and Michael Lee. As an extra bonus you will also find that Country music great Daryle Singletary is featured on “Drinking New Wine” and Zach’s wife, Laura, is featured on “God’s Honest Truth” as a background vocalist. Pigeon Forge, TN – The Guardians from Ohio are the newest artist scheduled to appear at Creekside Gospel Music Convention in Pigeon Forge, TN. This male trio, consisting of Dean Hickman, Dale Uhrig and John Darin Rowsey have had several songs on the national charts, with their latest single entitled “Somebody Prays,” also charting. The Convention has already announced several artists who will be performing, including The Freemans, Jordan’s Bridge, The Hoskins Family, John Lanier, Exodus, Dr. Jerry Goff and more. 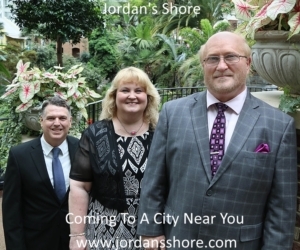 Joplin, Missouri (June 1, 2015) Up and coming Gospel family group, The Goulds have announced their Annual Homecoming on Friday, July 24th at 7:00 PM. The event will be held at Christ’s Community United Methodist Church located at 2700 E 44th Street in Joplin, Missouri. 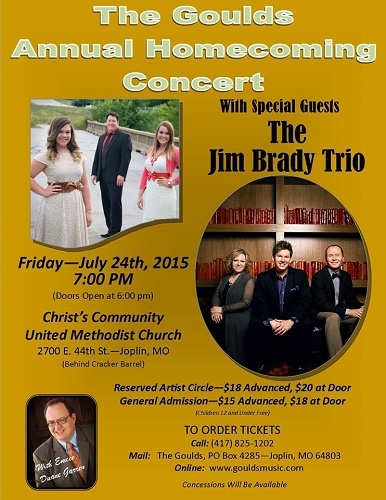 They are are excited that the Jim Brady Trio will be joining them this year along with emcee Duane Garren. 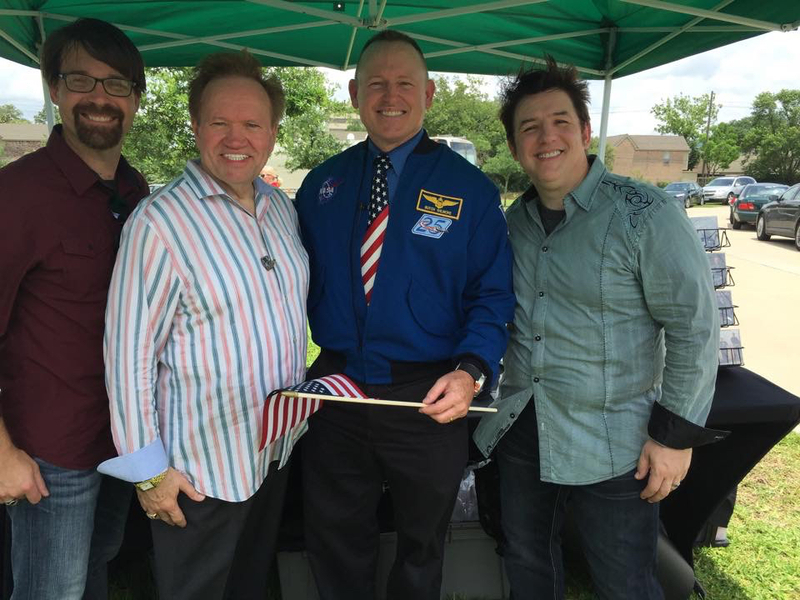 Jim Brady sang with the Booth Brothers for 12 years and has appeared on numerous Gaither Homecoming Videos as well as the Gaither Homecoming Concerts. Jim recently formed a new trio with his wife Melissa and their good friend Tim Parton. The Jim Brady Trio is already in high demand all across the nation and have numerous chart topping songs to their credit this year. The Jim Brady Trio is already known as one of the premier trios in Gospel Music and you don’t want to miss your chance to hear them and the Goulds together for the first time! This is going to be TWO GREAT TRIOS making up ONE FANTASTIC NIGHT!!!! To Order your tickets online visit the group’s website at http://www.gouldsmusic.com/ , call (417)825-1202, or mail The Goulds, PO Box 4285, Joplin, MO 64803.